This book contains 28 chapters representing the opinion of key vascular specialists. It covers a wide spectrum of definition and criteria of critical limb ischemia (CLI), its pathophysiology, epidemiology, assessment, and therapy. Objective criteria, which are associated with the definition of CLI, have been the source of many debates and, therefore, their disadvantages and limitations are presented and alternatives and recommendations are suggested. Present-day medical treatment of CLI includes spinal cord stimulation, antiplatelet drugs, defibrinating agents, vasoactive substances, and prostanoids. Therapies of choice, such as distal bypass surgery for extensive arterial disease, and alternative procedures are also surveyed. Clinical and surgical specialists concerned with endovascular and surgical intervention will benefit from this engaging treatise that stretches from general to specific medical conditions of CLI, quality of life, long-term morbidity and mortality, and the role of primary amputation. 1. The definition of critical limb ischemia: advantages and limitations. 2. The pathophysiology of critical limb ischemia. 3. Epidemiological and economical considerations in the critically ischemic limb. 4. The diabetic foot. clinical and pathological aspects. 5. The importance of the medical condition of the patient with critical limb ischemia. 6. Assessment of the microcirculation in critical limb ischemia. 7. Arterial mapping by duplex scanning in patients with critical limb ischemia. 8. Duplex scanning and angiography of the lower leg and foot arteries. M. Koelemay, D. Legemate, J. Reekers, M.J.H.M. Jacobs. 9. Medical treatment with prostanoids in patients with critical limb ischemia. 10. Non-prostanoid medical therapies in critical limb ischemia. 11. Spinal cord stimulation in critical limb ischemia. 12. Percutaneous transluminal therapy for critical limb ischemia. 13. Changing patterns in the treatment of lower limb ischemia. 14. Adjunctive Techniques to PTA: thrombolysis, suction embolectomy and rotablator. G. Coppi, R. Silingardi, R. Moratto, S. Camparini, G. Ragazzi, S. Gennai, R. Pancchioni. 15. Transluminal angioplasty combined with surgical reconstruction for lower limb ischemia. J-B. Ricco, C. Camiade, N. Mangiacotti, B. Ede, A. Branchereau. 16. Critical limb ischemia due to popliteal arterial aneurysm: endovascular approach. A. Nevelsteen, H. Lacroix, L. Stockx, P. Bernaerts. 18. Femorocrural bypass for limb salvage: real indications and results. 19. Bypass to the ankle and foot arteries. 20. Technical improvement of in-situ venous grafts. 21. Prosthetic femorocrural bypass and adjunctive procedures. J.M. Jausseran, J. Budd, S. Rouchet, J-F. Garbe, M. Ferdani, A. Lambert, G. Fadda, L. Di Giulio. 22. Infrainguinal bypass in the absence of saphenous vein: alternative venous conduits. 23. Infrainguinal arterial allografts for limb salvage. J-N. Albertini, X. Barral, A. Branchereau, J-P. Favre, H. Guidicelli, P-E. Magnan, J-L. Magne. 24. Distal arterial reconstruction combined with free muscle flaps. M. Lepantalo, F. Biancari, E. Tukiainen. 25. Is there a place for primary amputation?. 26. Intraoperative control of endovascular and surgical reconstructions for critical limb ischemia. 27. The cause of mid-term and long-term failures of arterial reconstruction: the role of surveillance with subsequent action. 28. Long-term morbidity and mortality of patients treated for critical limb ischemia. "...this is a useful reference on critical ischemia that provides a European wide perspective of the problem." "...a very good overview of the subject, ranging from the pathophysiological basis of the disease to treatment, including surgical, radiological and medical therapy. All clinicians practising in this field will find it extremely useful; trainees in all disciplines would benefit from reading this before their final examinations." "...an interesting and stimilating review of the management of critical limb ischemia which would be a useful addition to the library of vascular specialists." "This book is easy to read and well categorized, and it is succinctly written in a manuscript format. The text is complimented by quality radiographs, intraoperative photographs, simplistic yet informative drawings, life-table analysis, detailed tables to compare cumulative results of published data on the subjects, and pertinent references. 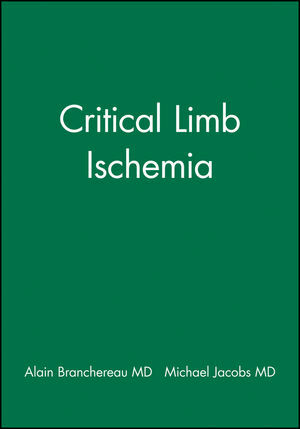 It is unequivocally an informative, concise text addressing the issue of critical limb ischemia with authority and current information. This book is a welcome addition to the libraries of readers of varying sophistication and expertise in their medical and surgical specialties." "This text is an excellent reference for residents and vascular surgeons. The book is not an anatomic exposure or operative techniques manual, as that was not the goal. The text focuses on results such as graft patency and limb salvage rates. No case studies or results are based on limited experiences. I like this book because I can read a brief chapter on a specific topic that contains reviews of previous reports with significant data."